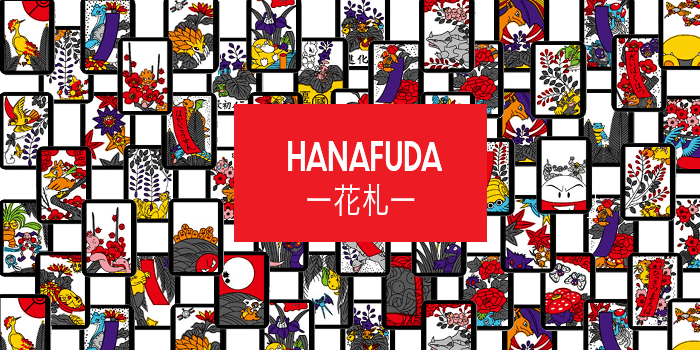 Before the Pokemon and Yu-Gi-Oh trading card games, Hanafuda was the original card game obsession in Japan! 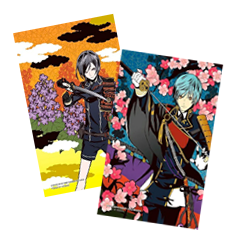 Hanafuda (花札, literally “flower cards”) are Japanese playing cards with a long history in Japanese culture. 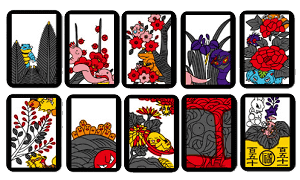 A Hanafuda card deck is made up of 48 cards in twelve suits, each suit corresponding with a month and its associated flower. 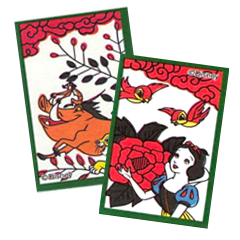 There are several ways to play with Hanafuda cards, but the shared objective of each game is to score the highest amounts of points by making combinations with cards known as “yaku.” Outside of Japan, Hanafuda is also widely played in South Korea (where it is known as “Hwatu”) and in the American state of Hawaii. Despite the cards depicting beautiful Japanese scenery, Hanafuda was born from prohibition, gambling, and yakuza. I’m sure you wouldn’t expect something named “flower cards” to have such a sordid history! Hanafuda got their beginnings with Hombre playing cards from Europe, which were first brought over by the Portuguese missionary Francis Xavier in 1549. These cards soon became wildly popular, especially to gamble with. When Japan closed its gates to the outside world in 1633, foreign playing cards were banned, but that didn’t stop gamblers from coming up with new ways to continue playing. To get around this prohibition on playing cards, new games and card designs were made, only to be shut down by the government once they caught on. Once the government realized they were fighting a losing battle, laws against gambling were loosened and eventually, Hanafuda cards were born! 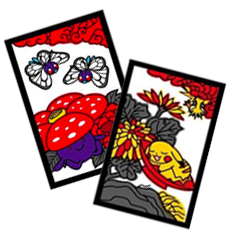 After the ban on playing cards was lifted, the Yakuza began using Hanafuda in their gambling parlors across Japan. But this association with the Yakuza and Hanafuda changed in 1889 when a Hanafuda-producing company named Nintendo was founded in Kyoto. 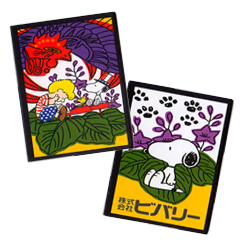 Yes, before the Game Boy and Wii, Nintendo was in the business of Hanafuda cards! 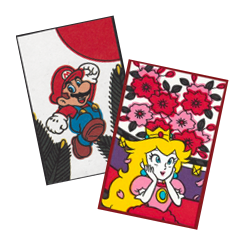 Nintendo’s cards helped bring Hanafuda back to the mainstream and they still produce cards to this day. 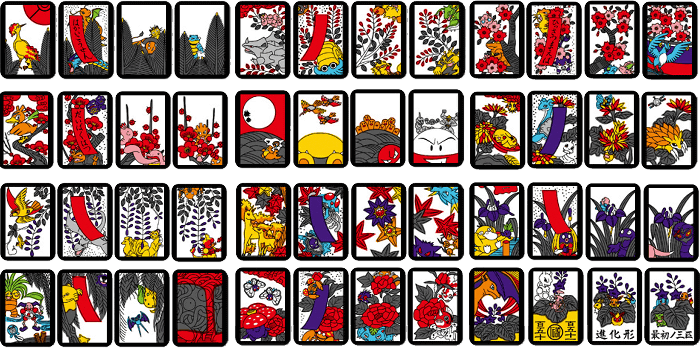 Many games can be played with Hanafuda cards, but “Koi-Koi” is considered the standard game of Hanafuda. In order to win Koi-Koi, you must score the most points at the end of either six or twelve rounds, by recovering cards dealt on the table. At the start of each round, you must match a card from the player’s hand with a card from the table from the same month. 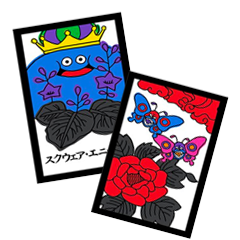 From there, points are obtained by forming card combinations known as “yaku” with the cards that the player has recovered from the table. Once a yaku has been formed, the player can either stop the round and score points (shobu) or continue (koi) to try and form more yaku in order to score more points. 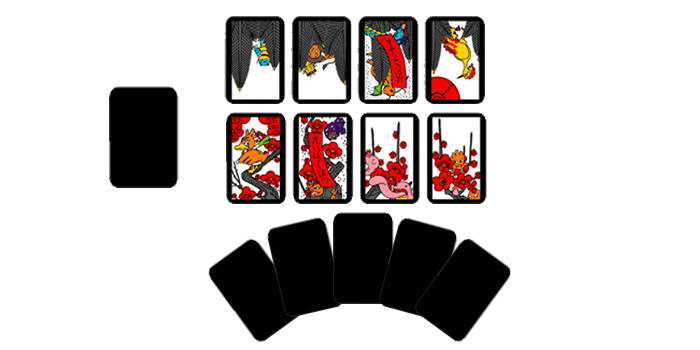 If the player fails to make a yaku with their eight cards, they will obtain no points and the next round will begin. After either six or twelve rounds, the scores in each round are totaled up, and the player with the highest score wins. Cherry Blossom with banner and the Sake Cup. Four Bright cards excluding the Rainman. Four Bright cards including the Rainman. Any three Bright cards excluding the Rainman. The Moon with Banner and the Sake Cup. The Boar, The Deer and The Butterflies. One point awarded for every additional Tane card. All three red poetry ribbons found in Pine, Ume, and Sakura. One point for every additional Tan card played. All three blue ribbon cards. One point awarded for every additional Tan card played. All three red ribbon cards and all three blue ribbon cards. One point awarded for every additional Tan card played. Any of the five ribbon Tan cards. One point awarded for every additional Tan card played. Any five of the ten-point cards. One point is awarded for every additional ten-point card plated. Any of the ten one-point Kasu cards. One point awarded for each additional one-point card played.